5 points because you need to EXPLAIN IN DETAIL HOW YOU SIMPLIFIED THE RATIO. A ratio is a comparison of two different values using division. 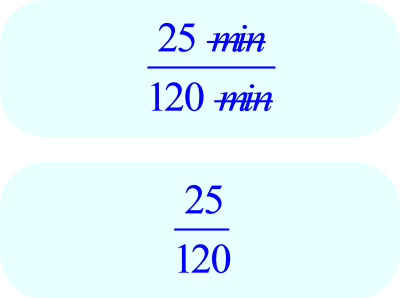 25 minutes to 120 minutes expresses the ratio (or proportion) in words. The order of the two values is important. In this case the 25 minutes is listed first and the 120 minutes is listed second. Mathematically, the ratio is usually written in (1) “odds notation” or (2) as a fraction. (2) To write the ratio as a fraction, place the first value in the numerator and the second value in the denominator (rather than the other way around). Multiply the remaining factors. This expresses the ratio in the lowest terms.